The Reform Cake (also known as “Reforma”) is the queen of all tortes in the Balkans (for another recipe from this region, see Phyllo Dough Pastry Apple Pie). 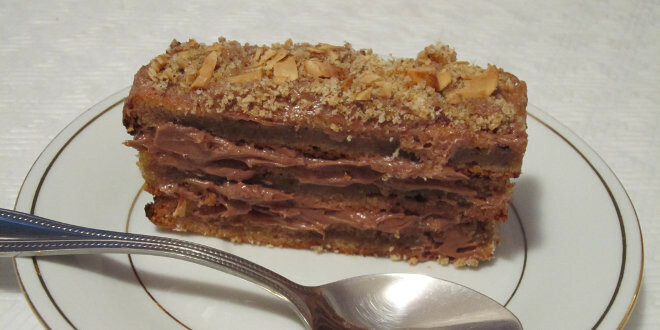 It is a completely gluten-free and yummy cake that you will want to make over and over again. 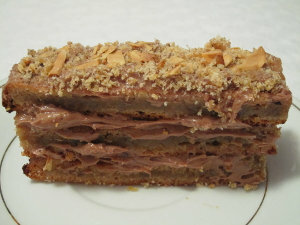 The Reform cake is very rich, nutritious and has a nougaty taste that your family and guests will love! Our detailed step-by-step instructions will ensure that you succeed the very first time you bake this delicious cake. Always prepare the cake a day before you plan to serve it. This ensures proper setting of the cream with the pastry layers. Use only fresh, medium size eggs. Pre-heat the oven to 175C (350F) degrees. Put the hazelnuts on a baking sheet and place in the oven for 10 to 15 minutes. Take hazelnuts out of the oven, and wrap them in the cloth while they are still hot. This will generate a little steam and it will loosen up the hazelnut skins. Rub the hazelnuts vigorously to remove the skins. If you decide to buy already ground hazelnuts in the store, make sure the skin were removed before grounding! If using almonds, it is best to use whole almonds (including the skin). You can also prepare this cake with ground walnuts or ground coconut. The finished cake can be stored in the freezer for longer periods of time or in the fridge until you need to serve it. Pre-heat the oven at 175C (350F) degrees. Wet the baking sheet by using a humid sponge. Place the parchment paper directly on the damp sheet. Note – original recipe: The cake will taste much better if, instead of using parchment paper, you coat the baking sheet with a thin layer of butter and flour. Important! Do not start until the oven has reached 175C (350F) degrees! The reason for this is when the mixture is ready, it must go into the oven immediately! Separate egg whites and place them into a large mixing bowl and add a pinch of salt. Beat the mixture on high speed until firm (approximately 5 minutes). Then, add sugar, on spoonful at a time while continuing to mix (additional 7 minutes). The mixture must be firm. Use a wooden spatula to carefully fold in the ground hazelnut from the bottom up because hazelnuts tend to sink towards to the bottom of the bowl. After adding all the ground hazelnut, pour the mixture into the baking sheet and smooth it out so that it covers the whole surface of the baking sheet. Important! Place the baking sheet into the oven right away! The baking tray should be placed on the middle oven rack for the optimal heat distribution. Bake the pastry for 15 minutes in a convection oven or 20-25 minutes in a regular oven or until a toothpick comes out clean. The pastry should have a nice golden colour. Remove the baking sheet out of the oven and let cool completely. Cut the pastry into three equal layers that will fit into your serving dish. You can also bake each layer separately by dividing the mixture in three equal parts and bake separately in a smaller baking pan. When baking, the pastry will first expand and then deflate a little bit. Nothing to worry about – any thickness of the pastry layer works well for the Reform cake! The old original recipe calls for 7 – 12 thinner pastry layers to make it crispy. This would require you to double the recipe! In our case, we will use three thicker pastry layers. In a double-boiler, pour water in bottom part, filling it to 5-6cm (2″) high , and bring it to a boil on stove. Pour 12 egg yolks, 120-150g of sugar and 20-30g of butter into the top part of the double-boiler and start mixing using the wooden spoon. Note: The water in the bottom part of the double boiler must not touch the bottom of the top part. The egg yolks will change to a pale yellow. The mixture is ready when the sugar is melted and the egg yolks start to firm up (approximately after 3-4 minutes or up to 10 minutes, depending on weather, level of humidity, etc). When the filling gets to the consistency of honey, add the chocolate and let melt for 1 minute. 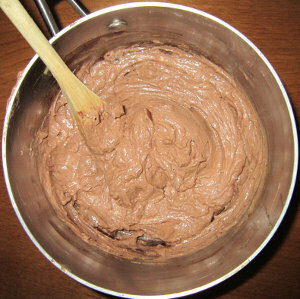 Remove the upper part of the double-boiler and continue to mix the filling until the chocolate is completely mixed in. The total time to prepare the filling varies, sometimes it can take 10-12 minutes and sometimes only 4-6 minutes. It is difficult to estimate before you start and it will take some practice to perfect this step. If the filling is too thick, add 2 or 3 tablespoons of hot milk or hot black coffee to the mixture. Stir until the filling becomes the right consistency. Let the filling cool down at room temperature. Do not place the filling in the fridge to speed up the process. Prepare the rest of the butter by letting it warm up slowly at room temperature. Do not melt the butter in the microwave. If the filling is still too warm or the butter is too cold, the filling will end up being too runny. Only when the filling has cooled down sufficiently, add room temperature butter to the cool cake filling. Then, use the electric mixer to mix the filling and the butter until creamy. This usually takes about 5-6 minutes. Separate the filling into three parts, two smaller and one larger part. 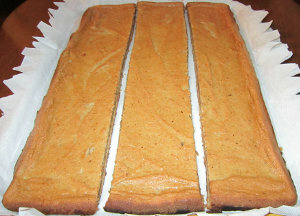 Use the two smaller parts to cover the pastry layers and use the larger part to spread the top and sides of the cake. Decorate the cake with sliced hazelnuts, sliced almonds or chocolate shavings. We hope that these detailed instructions do not look too scary for novice bakers, because when you make this gluten-free Reform Cake and try it – all your patience and invested time will be worth it!